On October 29th, 1929 Black Thursday, the Dow Jones Industrial Average plunged 11% or 30 points of the average’s 260 point total helping to spark the Great Depression. The Dow continued to hemorrhage for years and did not reach its pre-crash levels again until 1954. In 1987, the Dow dropped 508 points and lost 22% of its value on Black Monday, October 19th, 1987. Many experts are still undecided what caused this crash. There is even a strong correlation to the USSR’s financial movements in American markets that may have caused it. 2000 Technology Bubble – 617.78 points were lost on April 14, 2000 but just 5.6% of the index’s value. 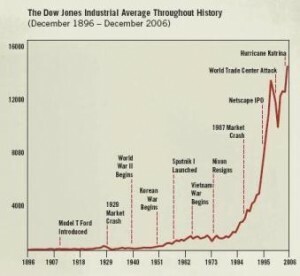 The Dow Jones Industrial Average had crossed the historic 10,000 mark in March 1999, but the index did not return to those heights again until December 2003 after the Tech Bubble burst and 9/11 faded from investors short term memory and worries. Monday, September 29th, 2008’s drop of 777.68 from the Dow was the single largest point drop in the history of the index. It was also the heaviest volume day in the history of Wall Street, with some 2.36 billion shares trading hands between investors. But there are a few key differences between yesterday’s historic crash and downfalls of the past. Despite being the largest single day point loss in history, the drop on Monday did not even make the Top 10 list of the biggest daily percentage drops that the market has seen. Yesterday’s loss was only a 6.9% loss of the index’s value. See the list below. Approximately $600 billion worth of investor wealth evaporated on Monday. The paper money losses correlate to a 5 percent drop in the broad Wilshire 5000 index. Yesterday’s losses cannot even begin to compare to the loss of investment values when the Technology Bubble burst in which over $6.1 trillion in investor wealth has been wiped out since the Nasdaq index hit its peak in March 2000. Approximately four out of every five stocks ended in negative territory money yesterday. So, for some perspective, the markets do bounce back after downfalls. The current market will rebound. The big question is when. No one knows how long this bear market will last, but investors must not lose sight that our stock markets are resilient. We will eventually rise back to the Dow’s all-time high, a peak of the 14,279 and beyond.